First Impression: After having this guy on my shelf for a few weeks, I finally realized it was called “Vampfire” and not “Vampire” Hot Sauce. Neat. The coloring book style vampire on the front of the bottle looks like he is halfway between bloodthirsty phantom of the night and your middle school science teacher dressed up for Halloween. “Made up the road from Translyvania, LA.” Hmm”¦yep, there is one, I just checked. I imagine this vampire warning us in his spookiest voice of the “VERY HOT” labeling of his sauce, yet I don’t imagine that freakish thing could create anything close to hot. Ingredients: Habanero peppers, tabasco peppers, cayenne peppers, distilled vinegar, onions, sugar, salt, spices, lemon oil, cellulose gum, and F.D.&C. red #40. Smell: This smells like there is too much of something in it. I do detect a citrus tinge from the lemon oil, but I think I’m going to blame it on the “spices,” whatever they are. Either there is too much of one of them, or there are just too many. When I was younger, I used to take every possible spice and bottled flavor enhancer in my mothers spice cabinet, mix it with water, milk, both, etc, and end up with these “potions.” I would not really do anything with them, but I remember what they smelled like, and it wasn’t too different from this sauce. Appearance: Vampfire is reddish brown, almost like a rust color. It’s significantly runny, with a complete absence of chunks. Teeny tiny specks of black and red are slightly visible. Taste: Initially, there is a sweetness that just sits there unsure of itself, like it’s afraid to reveal what’s underneath. Then a strong vinegar acidity bites through, along with the chile flavor, and finally the spice blend. I’m not sure if it’s the confused mixture of spices, or the dull, unresolved sweetness throughout, but something is amiss here. Or it could possibly be that the sauce itself got a bit stale. The flavor is not offensive; it’s just kind of blasÃ©. I’d imagine this would taste alright on a smoked cheese, or like a split pea soup. These are just the first things that come to mind, no real rhyme or reason. Heat: Hmm”¦well, it creeps up; I’d give it a low “hot,” rating, definitely not “very hot.” Sorry Dracula, or whoever you are. This sauce has an impressively slow rise to full strength, but it plateaus before any significant panting occurs, nesting warmly in a large mid-tongue area. In my opinion, no need for the additional “Caution! Extremely hot! Use sparingly” warnings on this sauce. It’s tame enough for most, though you might get a rise out of the less heat-inclined with it. Overall: Fair. Satisfactory. A little too much going on, a little too synthetic-tasting. The heat is decent, but not out of this world. Before I drive a steak into it (the misspelling was unintentional, but now I’m keeping it), I want to see how it will perform on some exquisitely tender looking pork cutlets I bought the other day”¦ladies and gentleman, I present to you Meathenge, inspired, somehow, by Vampfire Hot Sauce. It tasted just fine, and the heat complimented the swine quite agreeably. I cooked the pork with some Worcestershire, white wine, and soy sauce, so once I got some other flavors into the mix, a dousing of this stuff was a welcome and spicy addition. Another interesting review. Good job Brendan. Thanks for the review, Brendan. Yep, drive a “steak” through this one. I found a bottle of this years ago and never opened it. I liked the vampire on the front. I am a collector of sorts. I guess it will stay closed forever after reading your review!! Nice review Brendan, your meal looks good ! 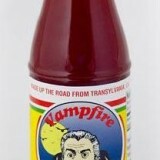 The Vampire on the label is supposed to be Christopher Lee, from the Hammer Horror Dracula films of the 60s and 70s.